The Skin79 Super Plus Triple Functions BB Vital Cream (Orange) was part of my Pretty and Cute haul. I've been enjoying the Skin79 masks (here and here) so much that I was actually delaying the start of the Skin79 BB Cream reviews, because I thought they would blow the other creams completely out of the running. Upgraded Sunscreen with UVA and UVB protection SPF50. Strengthen's skin NMF and maintain balanced skin condition. Osmopur-N and Vital-V Complex soothe and protect skin from harmful environments for a moisturized, healthy skin. This was the first test I've done where I gave up on a product before the testing period was over. 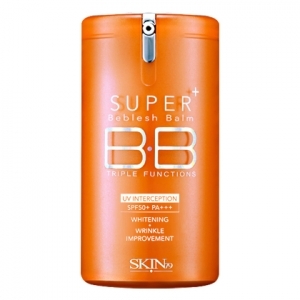 After finishing the second packet of this BB Cream, I contacted a friend of mine to see if she wanted to give it a try. It just wasn't working for me at all, but rather than throw away an unopened packet, I thought maybe it would work for her. She has promised a review after she tries it out, so look for her guest post soon! Day 1 - medium coverage, too light for skintone if applied heavily. I used too much, but wiped off excess and it looked nice. Very moisturizing, felt very nice going on. Has a satin finish. Doesn't feel oily. Feels light on but I can still tell I'm wearing it. Day 2 - Applied with fingers. Established First Rule of BB Creams = DO NOT APPLY BB CREAM WITH FINGERS. It has never looked good with any cream tried so far, so quit wasting product. Too heavy, blotchy, uneven wear, weird settling into pores. Awful. Had to wash face. Day 3 through 5 - Good wear, but when it dies, it dies a screaming death, settling into pores and then completely fading around the pores. Looks terrible. Minimal improvement to bare skin. I still like the fragrance. Not the best match for my skintone, it's too cool-toned for me. Can fix that with setting powder, but that turns the finish from satin to matte. Day 6 - Does not diminish appearance of pores. Mixed with Garnier BB cream and got a perfect match for my skintone. I don't like diluting the product, though, especially because Garnier is just a thick tinted moisturizer, and I end up feeling like I'm hindering and complexion improvements the Skin79 may be giving. Although, since I haven't seen complexion improvement in 6 days (I thought I'd at least see a more even skin tone/whitening), that may be a mute point. Day 7 - Finished second sample packet (each sample packet has enough for 3-4 uses). Used full strength, and it settled into pores again. It looks horrible. Washed my face and went bare-skined for the day. FINAL VERDICT - I will not re-purchase this cream. It did not work for me. I look for a BB cream to even out my skin tone, diminish pores, prevent and diminish wrinkles, and have a dewy finish. This one felt moisturizing and had a dewy finish, but the wear was awful on me. It settled into pores, and then faded from the skin around them, so I looked like I had ivory polka-dots all over my face. It was terrible! Because products often work differently for different people, I sent my remaining packet to a friend who has been interested in trying out a BB Cream. She will be writing a guest post about her experience with it, so keep an eye out for her perspective! UPDATE - READ HER GUEST POST HERE! I was about to try this product after finishing my trial period with other brand which has cause severe breakout. But after reading this, I'll search for more information before purchasing. I'm glad it helped you, Susan! :-) The one I have liked the best has been the Elisha Coy BB cream. Good luck!